Captain Syrup is the captain of the Black Sugar Gang and Wario's primary rival in thievery. Her base of operations is Kitchen Island, from which she sailed her former pirate ship, the SS Tea Cup. Her latest appearance is Wario Land: Shake It! where she commands the vessel, The Sweet Stuff. 1.1.3 Wario Land: Shake It! Captain Syrup made her debut appearance in Wario Land: Super Mario Land 3, where she is the captain of the Brown Sugar Pirates (as it is known in English). In this game the protagonist, Wario, still reeling from his defeat at the hands of Mario and the loss of his castle, sets out to find new riches. Wario decides to make his fortune by stealing all the treasures he can from someone else, which ended up being Captain Syrup. Syrup's gang has stolen many treasures, which are kept and guarded throughout Kitchen Island. One of the treasures Syrup's gang has stolen is a giant golden monument of Princess Toadstool that they are apparently holding for ransom to the Mushroom Kingdom. Ultimately, Wario decides to raid Syrup Castle, the location of Captain Syrup and her hoard of treasure. During battle, Syrup summons a Genie from a magic lamp, hops onto the genie's shoulders, and the two fly around, launching fireballs at Wario. Eventually, Wario defeats the genie; however, Captain Syrup escapes by blowing up her own castle, promising to get her revenge. Captain Syrup returns in Wario Land II. In this game, her pirate gang is renamed the Black Sugar Gang in English, as the pirates have always been known in Japanese. Syrup leads her pirates in a raid on Wario Castle and steals all of his riches. As such, Wario returns to Kitchen Island to retake all the treasures that were stolen from him. Wario battles Syrup several times during this adventure, compared to just once. In battle, Captain Syrup throws bombs at Wario, dash at him and control a robot from one of her various aircrafts. Eventually, Wario defeats Syrup in combat and takes back all of her treasures. After Syrup's final defeat to Wario in this game, she was not heard from for a lengthy period of time. Captain Syrup returns in Wario Land: Shake It!. 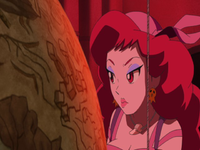 Captain Syrup is shown robbing the Ancient Globe from a museum, which she uses to observe the kidnapping of the Merfle tribe within the Shake Dimension. She finds out the existence of the Bottomless Coin Sack, which is in possession of the evil Shake King. Desiring the treasure but not wanting to get it herself, Captain Syrup sends a Merfle to give the Ancient Globe to Wario. The Merfle pursuades him to enter the dimension with the promise of treasure, sending Wario on a quest to unknowingly retrieve the Bottomless Coin Sack for Captain Syrup. Captain Syrup's role in the game is to sell Wario maps of the different continents of the Shake Dimension at the Pirate Shop, which also sells various health recovery items. Captain Syrup is shown to lightly flirt with Wario, calling him "handsome" on several occasions. At the end of the game, Wario takes the Bottomless Coin Sack for himself, but Captain Syrup takes it while he is not looking and runs off. Captain Syrup has a different ship in this game, The Sweet Stuff. While the SS Tea Cup took the form of its namesake, this vessel is shaped to resemble a treasure chest. Captain Syrup appears in Super Smash Bros. Ultimate as an Advanced-class Grab-type primary spirit. The spirit only boosts the user's overall power without granting any effect. In the spirit's battle, the player has to defeat Bayonetta and a giant grayscale King Dedede on the Pirate Ship stage. The opponents reference Captain Syrup and the Genie from Wario Land: Super Mario Land 3. In Syrup's first two appearances, she appears as a very tall and developed brunette. Her hair was long, curly, and reddish-brown, and her eyes were brown and she wore red lipstick. Syrup wore a cyan one-piece outfit which had large puffy leggings, was rounded at the hips, and had two loops at each shoulder. She also wore yellow clothes throughout her outfit, all of which were tied with twin bow-like ends; one as a bandanna on her head, two tied around her wrists, and one tied around her waist as a belt. Syrup also wore semi-long dark green boots and pink skull earrings. Aside from her individuality, Syrup's facial structure and features were very undefined and generic. In her re-debut in Wario Land: Shake it!, Syrup's design is revamped. Her former cyan clothing is replaced with a new purple-based design. No longer wearing a one-piece suit, Syrup now wears a light purple top mimicking the appearance of the last outfit's design. She also wears a large red belt with a white skull buckle, and knee-length, purple, puffy pants with torn leg openings. Replacing her green boots are purple boots with light bottoms and a pink roll-over ankle. She has light-purple wraps with long strands, and a light purple bandanna. Her accessories include a tooth-like necklace, and golden octopus earrings. Her hair is not much different from before, though it is red, and better detailed. She still wears red lipstick, and now wears blue eyeshadow and has red eyes and eyelashes. In the American instruction manual of the game Wario Land: Super Mario Land 3, Captain Syrup is always referred to with gender-neutral words. This was done in order to keep her gender reveal a surprise. In a Nintendo Power guide, Captain Syrup was mistakenly referred to as "The Princess". When the story of Wario Land: Shake It! was revealed in the Japanese Famitsu magazine, Captain Syrup was referred to as Maple, implying that her full name is Captain Maple Syrup. However, the name Maple is never used in the game at all. 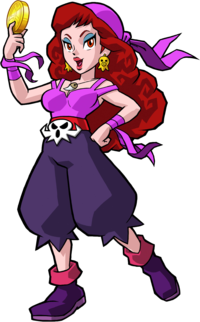 Captain Syrup was the first main female villain in the extended Mario series, coming before Cackletta, the Shadow Queen, and others. Though her artwork depicts her with boots, her Wario Land 2 sprite appears to be barefoot, likely due to palette limitations. This page was last edited on April 8, 2019, at 17:31.